This week’s competition has been donated by Posh Girl Vintage, a vintage online clothing store which is family owned & operated in beautiful Southern California. Our family has a long history in the clothing business. You could say it’s in our blood. Mother, daughter & grandmother have all worked in the clothing & entertainment industry since the early 1950’s. Our family owned 2 high end fashion boutiques in Newport Beach & Laguna Beach California during the 70’s & 80’s. My grandmother was the head buyer for 2 major department stores in Newport Beach. One being Richard’s during the 50’s, 60’s & 70’s, and interior designer for John Wayne and other high profile people in and around Balboa Island. After shopping on-line for vintage clothing I realized what I wanted was not on the web. I found either dirty thrift store quality clothes with really poorly designed websites, or really expensive museum quality clothing. So I set out to build Posh Girl Vintage clothing store. My goal was to build an on-line store that was modern & easy to use with great unique wearable quality vintage clothing at a fair price & honest service. 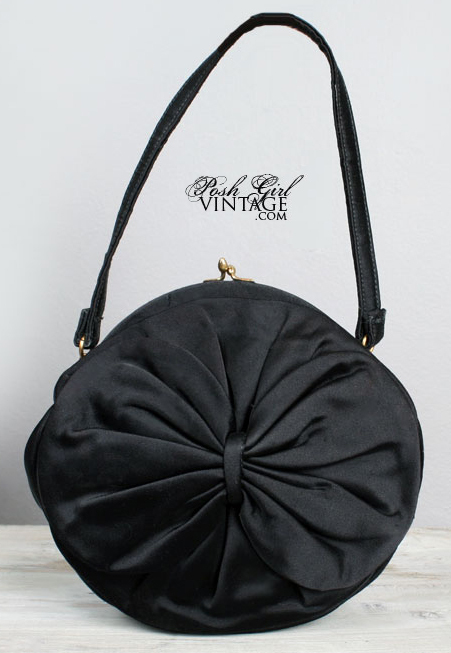 This is an adorable little black silk handbag purse from the 50’s. It’s round with a bow on the front and back. Metal hardware, lined in black fabric, looks never used. A classic evening bag that will never go out of style! Condition Details: No holes or stains. Looks never used. For your chance to win this beautiful vintage bag simply tell us your favourite item from Posh Girl Vintage and let us know in the comment box below.We’ll pick a winner after entries close on Thursday 19th July. The winner will be announced on this blog soon afterwards so don’t forget to check back or subscribe! We will contact the winner shortly afterwards and pass their details onto Posh Girl Vintage who will send out the prize directly. There are no country restrictions, prize can be shipped worldwide (up to a shipping value to $15). Posh Girl Vintage will not be held responsible for lost items or any import fees for addresses overseas. I love this hat….very boy george ! I’m loving this dress, so summery and carefree. I love this cute LBD from the 40’s : timeless! I am in love with the 1950s blue poodle sweater! Its sooo mych fun and screams 1950s!! I think I saw every pages of this vintage store… hypnotic. Would look great today in Paris summer heat. The bag is lovely too ! Fingers crossed. That marvelous litlle pink dress whit the big green cat on it. It’s unique! And the tiny white bows, so cute! I’m in love with this 1950s dress. It’s so unique. Think I’d feel like I’d stepped off a Hollywood film set if I was wearing it as it looks like a real one-off, designed for a special lady. Love it! I loved Posh Girl Vintage! I love the 1950’s Alfred Shaheen Hawaiian Print Shelf Bust Dress http://www.poshgirlvintage.com/1950s-alfred-shaheen-hawaiian-print-shelf-bust-dress-m-p-3355.html It looks so summery and elegant! 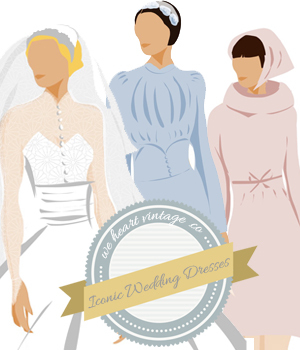 My favourite is the 1950s Brown and White Bobbi Brooks Day Dress. I love the 1950’s Alfred Shaheen Hawaiian Print Shelf Bust Dress. AMAZING!! My favourite item would have to be http://www.poshgirlvintage.com/1950s-ivory-lace-tiers-tea-length-dress-m-p-3215.html such a beautiful vintage wedding dress!!! I love it! My favourite has to be the 1950s Pink cotton Appliqué tea length dress. Very pretty and feminine. Not sure I’d have the legs to pull it off though lol. Im a huge coat fan and 1940’s Art Deco Black Belted Princess Coat is very simple and elegant and totally me! Tricky – but this is very unusual – 1940’s Western Style Leather Belt Lucky. I love the : 1930’s Film Noire Black Wool Fitted Princess Coat, Amazing. I love this dress http://www.poshgirlvintage.com/1940s-white-long-classic-semi-sheer-dress-m-p-3254.html it’s so nice! I adore the 1930’s Peach Knit Shrug Sweater simply and classy beautiful!!! I’ve fallen in love with the 1910’s White Cotton Crochet Lace Antique Lawn Dress. All you’d next is some sun! http://www.poshgirlvintage.com/1960s-denim-long-hippie-maxi-skirt-matching-top-m-p-2479.html for summer. There are a few great bags on your site that would be perfect with this set also! I just love and want this !!! 60’s black suede w/gold rivets go go boots , wow ! 1970’s Vintage Biker Boots in Black Leather….lovely! I love this white floaty dress http://www.poshgirlvintage.com/1930s-adorable-vintage-little-white-dress-p-3392.html it’s so cute for summer! I love the brown and black print 1950s halter sundress – very different and stylish! I am loving the 1930’s Saks Fifth Ave Long Velvet Ermin Fur Evening Dress. So sophisticated and glamorous. I love this dress- very chic! 1930’s miss hollywood rare black dress – never dates just pure class. I absolutely adore the 1940s Black Belted Princess coat, it’s stylish, with a super feminine cut that would so suit my figure. Definitely something to truly lust after! The 1950s pink cotton applique tea length dress is my favourite – it was hard to choose though! Great give away and a lovely prize. I love this as I think it will show off my figure beautifully! I love most of them! My personal favourite (by a thread) is the 1950’s Teal Taffeta Tea length Evening Dress. It is absolutely stunning and will look fantastic on my niece for her prom and when I lose my baby weight on me too! I adore this lovely flapper dress! The 1960’s Black Cotton Tea Length Halter Dress is definitely my fave! It’s gorgeous and so classic and feminine. Timeless too. My favourite is the 1920’s Silk Black & Orange Dress Set. http://www.poshgirlvintage.com/1970s-designer-print-long-maxi-dress-m-p-2649.html Its perfect for wearing on holiday and in the summer (if we ever have one!) at home. Theres some fantastic clothes on the site that suit so many occasions, will have to remember for the future. I would have to say the thing I like most are those totally awesome gloves by Lilly Dache. I’ve never seen a pair of gloves that tie back the way these do…so elegant! I’d love to enter the drawing for the purse. Thank you! This item is so unique, I would love to own it one day!! I love the 1970’s Leather & Indian Rug Western Style Travel Luggage Bag.